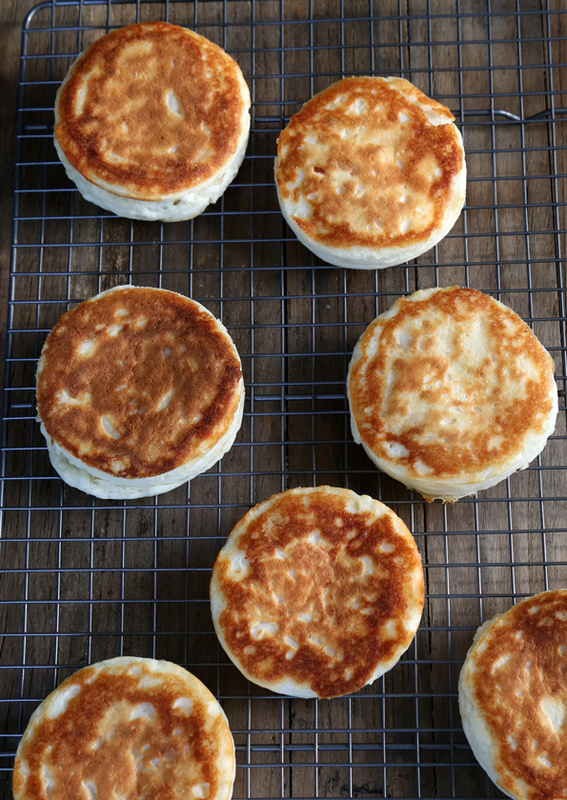 Super Fluffy Gluten Free English Muffins | Great gluten free recipes for every occasion. These super fluffy gluten free English muffins have nooks and crannies that will put Thomas to shame in a hurry. Once they’re cooled and fork-split, they freeze perfectly. And you can even finish them in a toaster oven instead of a traditional oven so your kitchen stays cool. Clearly, they’re a breakfast home run. I started out thinking I was making gluten free English crumpets—those cousins of gluten free English muffins that remind me of sturdier pancakes that are cooked on one side only, until bubbles break through the surface. I started with the recipe for gluten free English Muffins from page 118 of Gluten Free on a Shoestring Bakes Bread (which is adapted from the recipe for English Muffin Bread from page 74), and went from there. The difference between the dough for crumpets and the dough for English muffins is mostly one of hydration percentages. 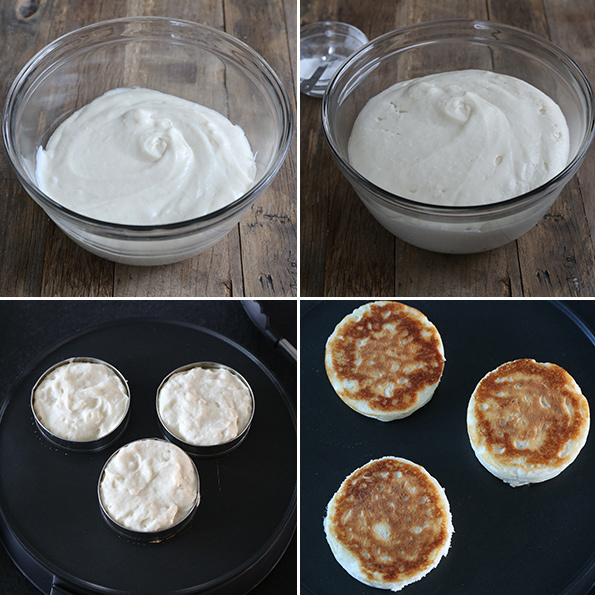 Crumpet dough is more like pancake batter than any bread dough. English muffin dough seems kind of like how pre-gluten-free-bread-revolution gluten free bread dough—very, very wet (although not quite freely pourable). 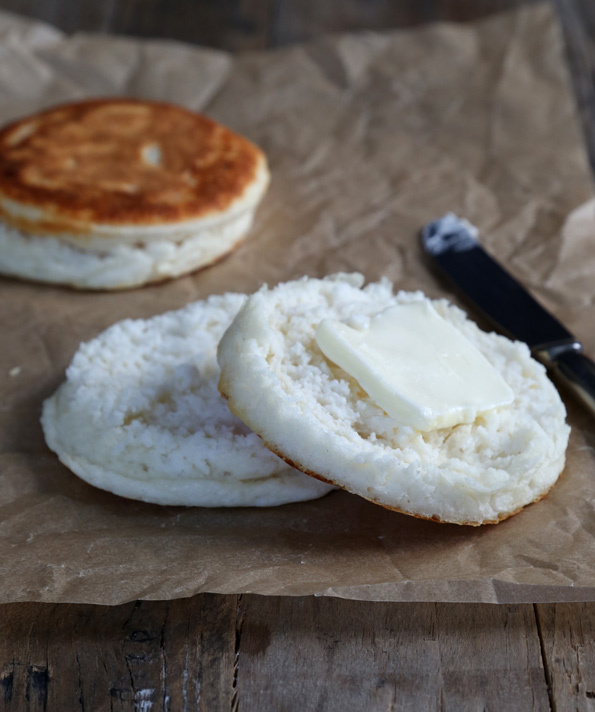 So what’s the difference between the English muffins from GFOAS Bakes Bread and these super fluffy English muffins? A few things, but it’s also mostly a matter of hydration. I won’t bore you with more of the details. I hear the devil is in there anyway. Here’s what you need to know about making these muffins: they’re ridiculously easy. Just mix up the dough (with a whisk! ), set it to rise for about 30 minutes, mix in the salt and baking powder right before filling English muffin rings (1-inch rings cut from empty aluminum cans work just fine, if you don’t have actual rings) and letting them cook. Finish them in the oven or the toaster oven (or even in the skillet!) and let them cool. For a calculator that helps you build the flour using my Mock Better Batter, but without doing any math, please see my Gluten Free Flour page. 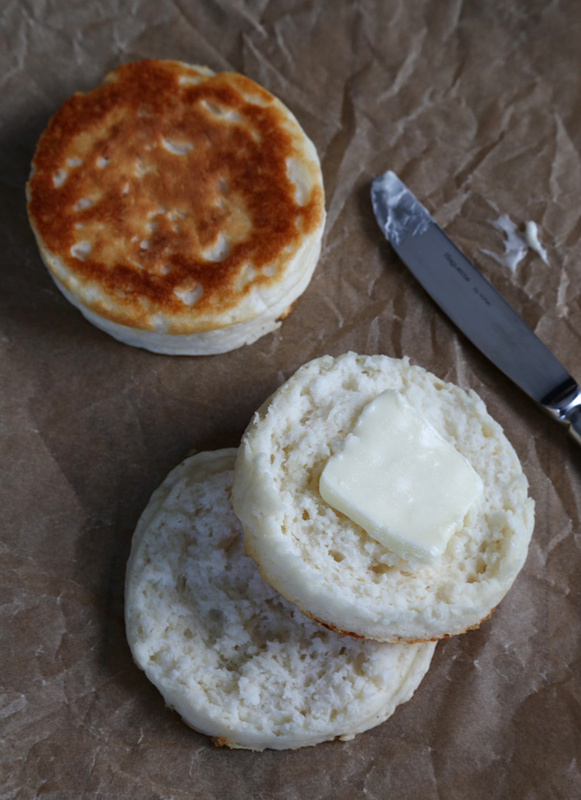 **To avoid turning on your oven, you can either finish baking the English muffins in a toaster oven preheated to the same temperature, or try covering your skillet once the muffins are on the second side, reducing the heat to low and cooking until the internal temperature of the muffins reaches 195°F. Place a 10-inch cast iron skillet over medium heat, or heat a griddle to medium. While the pan or griddle is heating, grease four metal English muffin rings (1-inch rings cut from empty aluminum cans also work well) and place them in the hot pan or griddle. In a separate, small bowl, whisk together the baking powder and salt. Uncover the bowl of dough and mix in the baking powder and salt. Using a spring-loaded ice cream scoop (or two spoons), fill the English muffin rings about three-quarters of the way full with the dough. Allow the muffins to cook for about 5 minutes before using tongs or a spatula to flip the rings with the muffins inside and cooking for another 3 to 5 minutes or until the underside of the muffins is lightly golden brown. Transfer the muffins in the rings to a prepared baking sheet, carefully remove the rings using the tongs, and place in the preheated oven (or toaster oven) to bake until the internal temperature reaches 195°F (about 7 minutes). Alternatively, cover the skillet or griddle until cooked through completely. Repeat with the remaining dough, using more greased muffin rings. As soon as the muffins are finished baking or cooking, transfer them to a wire rack to cool completely. Split each muffin with a fork by inserting the tines in the center of the muffin along the middle, parallel to the muffin itself, and gently pry open the muffin with your fingers. Serve warm. With butter. Lots of butter. Adapted from the recipe for English Muffins on page 118 of Gluten-Free on a Shoestring Bakes Bread. Could I sub with rice milk? O.k Nicole I answered my own question. These can be cooked in a shallow cast iron muffin pan, it takes a bit longer and they still need to be flipped. I also cooked some in aluminum foil rings but they fell out when flipping them. One of the twins stated that if he had to eat these everyday for the rest of his life he’d be happy. High praise from a teenager! Nicole, can I just put these in a cast iron English muffin pan, instead of the rings? Thanks. amazing!!!! i made these this morning, and did some desperate substitutions in my pre-second-coffee haze… used plain yogurt because i didn’t have milk, and basic gluten free all-purpose flour because i didn’t have bread flour. also i was too impatient to let them rise the whole way and i might have dumped in way too much baking powder and salt. BUT THEY WERE STILL SO FREAKING GOOD! topped them ham and an egg, all benedict style. YAY! Made these today. They are simple to make, and came out great! these look great and i can’t wait to try them.I have a question about the icecream sandwiches.Do you think they would work in glass pans or would i have to buy metal? I would love to make them, because I personally, have missed them on hot summer days.I would really appreciate a response,thanks! tried the ones from the 2nd cookbook,and they worked out pretty well. going to try these soon. thanks nicole! 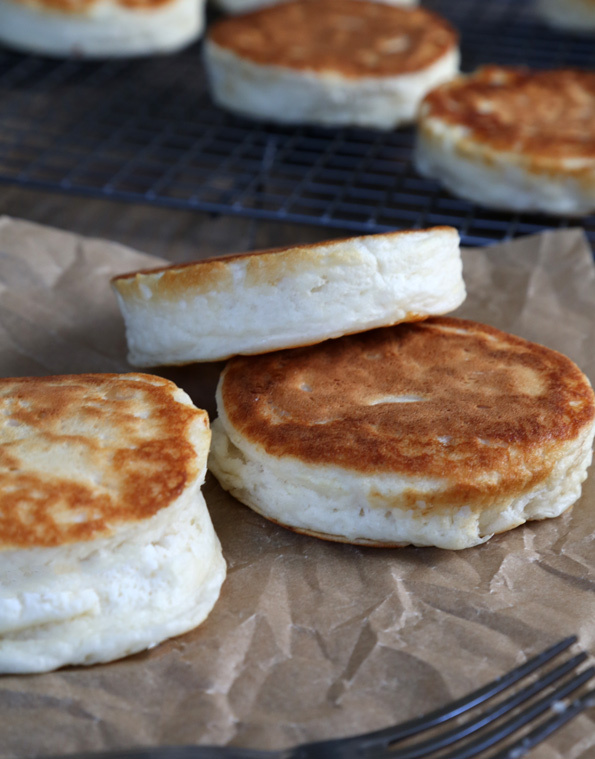 I’m embarrassed to say I’ve never made homemade English muffins (gluten-free or not) but all this talk about nooks and crannies has me planning it in very soon. Yours are the picture of perfection as always, Nicole! Did you measure your ingredients by weight? It makes a huge difference. Seconded on the weighing of ingredients. Did you use Nicole’s flour blend? That’s really important, too. Looks like you already got some great advice from fellow readers, Melissa! If you made substitutions, I’d always look there first. Yeah, I’m gonna be making these guys! I wish my kids didn’t get up so early; I just can’t bring myself to get up early enough to have the extra 30 minutes required to make something like this fresh in the morning. Guess they’ll have to continuing suffering with fresh from the freezer breakfast. Poor babies. Even I’m not that mean, Nicole, they already get up at 5:30! Any earlier and I think they might punch me, actual cooking might be too much to ask for. THANK YOU these are probably going to be a weekly baking project. Where do you find English Muffin rings ?? Live in the mountains and nothing is nearby. Will have to buy a big package of Canadian bacon also. Hi, Carole, I bought some of my English muffin rings in a local kitchen supply store, and others online at amazon. I think the brand is Fox Run, but I also think King Arthur Flour sells their own, too. Oh my god these look so good! I’m definitely going to make these, my favorite breakfast food is eggs benedict and I’ve been without a real english muffin for this dish since I was diagnosed with celiac in 2008! Oh these are definitely perfect for eggs benedict, Elizabeth! I have also used aluminum foil to make muffin rings, folded over three or four times then joined by folding the ends together. I can’t wait to try these out! I made two recipes of Apricot Crumble Bars yesterday, I had two pieces they were soooo good! That aluminum foil method sounds great, Lucy. It would probably be really great with heavy-duty foil, if you have it. Love that you’re all over that Apricot Crumble Bar recipe, Lucy! Holy Moly Macaroni!!!!! I think I’ve been waiting my whole life for these AND I just ran out of my other ones….. thank you!